The buyer’s journey has changed. With the internet at our fingertips, consumer’s have the ability to research and compare solutions like no generation before. They also have access to mountains of user generated content like peer reviews – which are trusted nearly as much as referrals. More empowered buyers has resulted in longer sales cycles. People no longer go straight to the source to make purchase decisions. Today, there are an average of 7 decision-makers involved in the B2B buying process. And, 50-90% of the journey is complete before a buyer interacts with a sales rep. This shift in behavior should be taken seriously by any sales team, whether inside or out in the field. With so much change, sales managers need to look at current research and trends to find insights to guide strategies. Here is a list of 118 sales statistics broken out across 17 categories. Use the data to drive your sales approach into the second half of 2018. Inside sales is one of the fastest growing areas of the sales organization. Statistics suggest that one of the largest growth levers of inside sales is the opportunity it presents a company to be a “first responder”. Takeaway: Speed is everything in sales. Having a structure in place for inside sales reps to make quick and efficient calls can make all the difference. If a company can be “first to the scene” on a regular basis you’re going to see an uptick in conversions. Outside Sales is probably what you think of when someone says “salesman”. While the sales ecosystem is shifting, this field still has some of the highest quota attaining percentages out there. Face to face or field sales teams make up 71.2% of the sales force. 65.0% of outside account executives are attaining quota which is 10% higher than inside reps.
Outside Sales Reps Now Spend 89% More Time Selling Remotely Than in 2013. Takeaway: Pound the pavement. Outside sales teams are a big driver when it comes to hitting sales quotas. While technology gives us the ability to “be” anywhere in the world at any time, there is no substitute for real-life one on one interaction. Inside and outside sales teams can, and in most cases should, work together. The way companies prospect for leads is changing. Face to face used to be the best (and sometimes only) way to really connect with potential clients. Now with the introduction of mobile devices, email, texting and other digital channels, reps have countless avenues to find, vet, and reach prospects. More than 40% of salespeople say prospecting is the most challenging part of the sales process, followed by closing (36%) and qualifying (22%). 8 in 10 prospects prefer talking to reps over email, which matches up with the percentage of reps (78%) who use it. Prospects are open to communicating with sellers at industry events (34%), via LinkedIn (21%), text (21%), voicemail (21%) and social media (18%). 50% of buyers like speaking over phone, compared to 70% of reps. This percentage increases the higher up the ladder (VP or C-suite) you go. More than 50% of prospects want to see how your product works on the first call. 9 in 10 companies use 2+ lead enrichment tools to learn more about prospects. Takeaway: Prospecting is one of the hardest tasks assigned to a sales rep. Today’s technology makes it easier to find, and reach, prospective customers. Invest in a toolset that allows you to quickly build profiles and find accurate lead data in your target market. For example: Spotio’s Lead Machine gives reps and managers a competitive advantage because they are able to quickly build detailed customer profiles and map territories filled with qualified prospects in minutes. You might have heard the saying, “cold calling is dead”. Well, the data suggests otherwise. An industry study showed companies who said cold calling is dead experienced 42% less growth than those who said it was alive. In 2007 it took 3.68 cold call attempts to reach a prospect. Today it takes 8 attempts. On average, sales managers make no more than 2 attempts to get a lead through cold calls. It takes an average of 18 calls to actually connect with a buyer. 42% of sales reps feel they don’t have enough information before making a call. 85% of prospects and customers are dissatisfied with their on-the-phone experience. When leaving a voicemail for a prospect, the optimal length is between 8 and 14 seconds. 44% of salespeople give up after one follow-up call. Takeaway: Persistence. Persistence. Persistence. Making sales calls, especially cold calls, will never be an easy task. The key to success, however, is having thick skin along with a plan to follow up. Provide your reps with call scripts, and train them on handling the most common sales objections. This will make the process much more approachable. Set clear call goals, and always track activity in your CRM. While almost everyone is on social media these days, adoption and integration into the selling process is slow. Most reps rely exclusively on email and phone calls to find, close and retain business. While these channels are all important, missing the social selling train can be very costly. 78% of salespeople using social media outsell their peers. 31% of B2B professionals said that social selling allowed them to build deeper relationships with their clients. Sales reps who use social selling are 50% more likely to meet or exceed their quota. 63.4 percent of sales reps engaged in social selling report an increase in their company’s revenue (compared to just 41.2 percent of non-social sellers). Four in 10 reps have closed 2-5 deals directly thanks to social media. Using social selling tools can increase the average deal size by 35%. Takeaway: Reps that embrace social selling usually have more prospects in the pipeline and outsell their competitors. Make it a part of the sales process to first connect with prospective clients before engaging through other sales channels – outbound, email, phone etc. Warm connections will usually deliver higher response rates, and more set appointments. Referrals are gold. Getting a referral from a happy client is stronger than any sales pitch you could make. Despite the bottom line value of weaving referrals into the fabric of your sales process, very few reps are actively asking for them. Takeaway: Ask for referrals – get more sales. It really is that simple. There is no better way to start a sales process than with a referral from a trusted friend or colleague. Make this a mandatory part of your ongoing sales strategy. Specifically, make it a point to ask for referrals after positive customer engagements – testimonials, reviews and high NPS scores. Email is one of the most powerful sales tools for any company – the channel has a reported 44:1 ROI. With so much potential, comes a lot of competition. The average person receives 147 emails every day! The battle to stand out in the inbox is more fierce than ever. Sales teams need to embrace and adapt to this challenge if they want to realize the bottom line benefits of email marketing. B2B customers have become desensitized to words such as “reports”, “forecasts”, and “intelligence” (source). Takeaway: People are bombarded with emails from sunrise to sunset. It’s important to craft subject lines that use power words proven to win the open. Also, with nearly four in every ten emails opened on a mobile device subject lines should be kept short. Bonus: Use social and email together to get higher engagement rates. A simple way to do this is connecting with prospects on social media prior to sending emails. Once the connection has been made prospects will be more likely to open an email from a familiar source. Most reps give up on the sale way too early. Prospects typically require multiple touchpoints across numerous channels before they ever speak to a sales rep, especially in a B2B setting where sales cycles are longer with more decision-makers. 80% of sales require 5 follow-up calls after the meeting. 50% of buyers choose the vendor that responds first. Drift tested the response time of 433 companies. Only 7% responded in the first five minutes after a form submission. Over 50% didn’t respond within five business days. An analysis of more than 2,200 American companies found those who attempted to reach leads within an hour were nearly seven times likelier to have meaningful conversations with decision makers than those who waited even sixty minutes. Takeaway: Be prompt, be persistent. Very rarely will a sale occur on the first touch-point. Make sure your sales reps are following up multiple times across different channels in the days or weeks following the initial contact. Use lead management software to make sure reps are following up at the right times. Best-in-class companies close 30% of sales qualified leads while average companies close 20%. 48% of sales calls end without an attempt to close the sale and the national sales closing rate is 27%. Takeaway: Closing is hard. A lot of reps avoid it. Always have a clear call-to-action at the end of every touchpoint. This doesn’t have to be a sale, but it should at least be a scheduled follow-up call with key decision makers to keep the sales process moving along. The sales cycle is longer and more complex. As a result, the way businesses generate and nurture leads is changing. Single touchpoint sales are rare. Both marketers and sales teams now need to work together closely to guide consumers along the path to purchase. Companies who have implemented a repeatable system for nurturing leads have shown much higher lead-close rates. Takeaway: Make sure you have a sales CRM in place to educate, build trust, position and move prospects through the funnel. As you plan out a lead nurturing sequence, think about the types of information a lead will need to be tagged as sales-ready, move into the opportunity phase, and ultimately close into a paying customer. This content will likely be different for each persona, so make sure you are properly segmenting lists in the CRM to ensure the right information is sent to the right person, at the right time. Not all leads are created equal. Ensuring your sales team is only “working” the most qualified prospects (SQLs) will help improve productivity – save time, energy and money – and boost conversion rates. 46% of B2B sales reps list lead quantity and quality as their top challenge. 67% of lost sales are a result of sales reps not properly qualifying potential customers before taking them through the full sales process. Takeaway: Sales reps spend a lot of time and energy working unqualified leads. Set up a lead scoring system to ensure reps are only engaging the leads ready to buy. The B2B sales process is longer and much more complex than ever a few years ago. There are more decision makers involved with many more touch points along the way. 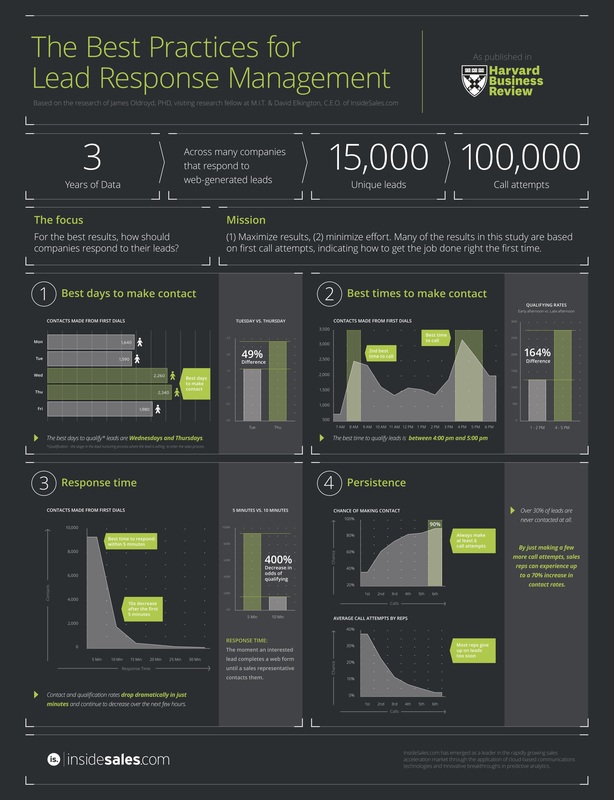 As a result, much of B2B sales process is done well before a rep ever contacts a prospect. B2B buyers are 57%-70% through buying research before contacting sales. 62% of B2B buyers say a web search was one of the first three resources they use to learn about a solution. 84% of B2B decision makers begin their buying process with a referral. ~ Sales Benchmark Index. Takeaway: B2B buyers (heavily) research and compare competitor products. Organizations need to create in-depth comparison guides that make it easy for buyers to weigh up a product against the competition, and clearly see why it is a superior offering. These assets can not only drive targeted mid-funnel traffic to your website, but also act as powerful sales enablement materials that reps can share through email with prospects in the evaluation stage of the buying cycle. Today’s buyers are more educated than ever before. No longer should sales and marketing teams operate in silos. Teams need to collaborate using content to not only educate and engage buyers, but to also enable sales reps to become effective closers. 94% of B2B buyers will research online before finalizing a purchase. When asked which marketing tactic provides higher quality leads for the sales team, 59% of marketers responded inbound, and 16% reported outbound (source). Takeaway: Sales and marketing teams need to be tightly aligned. Sit down and brainstorm a list of topics/ questions your ideal customer is searching for online during the awareness, consideration and purchase phases of the buyer journey. Craft content that answers those questions, and amplify it across the channels where your target customers spend the most time. The more educated the buyer, the faster and easier they close. Outbound sales can be the lifeblood of your company. The trick is making sure sales reps are put into a position to succeed. 42 percent of sales reps feel they don’t have enough information prior to making a call. Takeaway: While inbound marketing has seen an explosion in popularity, there is still a place in most organization for traditional outbound sales tactics. The key is make sure reps are armed with enough information about a prospect’s business, pain points and goals to craft a message that will resonate enough to win email opens, call backs and appointments. In an ideal scenario, sales reps would spend all their time prospecting, sending emails, making phone calls, following up and nurturing leads. But, as you’ll see, this is not the case. In fact, most of a reps time is spent on non-sales activities. Only 39% of a sales rep’s time is spent selling or interacting with prospects and customers. Only 60% of sales reps meet quota (source). High-performing sales teams use nearly three times the amount of sales technology than underperforming teams (source). 79% of sales executives say a leading driver of hitting new targets is improving the productivity of existing sales reps (source). 81% of companies say productivity would improve with better process, skills, or competency training (source). 84% of sales executives cited content search and utilization as the top productivity improvement area. The typical organization spends 24K per person on improving productivity, yet 49% of organizations have zero or limited means to measure productivity (source). Takeaway: Make sure you have the right processes and tools in place to help reps work smarter, not harder. We put together an in-depth guide on how to increase sales team productivity here. Hiring dynamic reps who are passionate about your product or services is only half the battle when it comes to building and retaining a high-performing sales team. Today, over half of reps lack basic sales skills, and don’t receive adequate training. This is crazy when you consider ongoing training is the leading driver of high-performing sales organizations. According to Forbes magazine, 55% of salespeople lack basic sales skills. 58 percent of buyers report that sales reps are unable to answer their questions effectively. According to a recent survey, 84% of all sales training is lost after 90 days. This is majorly due to the lack of information retention among sales personnel. According to a recent report, every dollar invested in sales training returned $29 in incremental revenues. According to a recent report, the best sales training will improve the performance of an individual on average by 20%. According to an ATD report, US companies spend $20 billion yearly on sales training. Firms where salespeople use the company’s methodology and get consistent coaching see 73% quota attainment. Takeaway: Untrained salespeople doom companies. Organizations that spend more time training reps see better sales numbers. Seems like a no-brainer, but over half of sales reps are lacking the proper skills to become effective at their job. A long-term commitment to ongoing training – seminars, workshops, books – will give your sales team a competitive advantage. The sales industry isn’t for everyone. Large scale turnover is a real thing. Understanding this can help companies prepare for, and handle the change. Statistics show what kind of people will succeed in the sales industry which can help inform the hiring process. Only 39% of salespeople intended to go into sales. Forrester predicts one million sales reps will be out of a job by 2020. The average SDR performs 94.4 activities a day, including social, call, voicemail, and email touches. Takeaway: Sales is hard. Turnover is a lot higher than other industries. It’s critical your organization has a clearly defined process for finding, interviewing and hiring high-performing reps. Look at the top sales reps and make a list of what makes them good for the position. Hire more of those people.